Lt. Gen. Arnold W. Bunch Jr., the military deputy for the Air Force’s assistant secretary for acquisition, speaks to the Georgia Honor Flight and onlookers at the National World War II Memorial in Washington, D.C., April 30, 2016. The Georgia Honor Flight was one of many such flights to visit the nation’s capital through the Honor Flight Network. Clouds lingered overhead, as young and old walked around the water fountain at the National World War II Memorial. Couples took photos of one another while mothers and fathers tried to keep track of children attempting to run free. A leather-skinned gentleman, standing upright with his shoulders back, strolled arm-in-arm with another man who walked with a slight limp. The two, both with slight smiles on their age-worn faces, reminisced about the war they survived together while touring their memorial. More than 70 years ago, World War II ended taking with it the lives of more than 400,000 members of the U.S. armed forces. While countries signed treaties and rebuilt cities, those who survived returned home, carrying both visible and invisible wounds of the war. Nearly 59 years passed before the memorial was dedicated to the 16 million who served in the war and the millions who supported from home. Retired Air Force Capt. Earl Morse founded the Honor Flight Network around the time the memorial was dedicated. Thanks to Morse’s efforts, there are currently 127 hubs in 41 states, and more than 100,000 veterans are able to tour the memorial annually. Paul Morell, a World War II Army Air Corps veteran, and his son, Dr. Mark Moore, visit the National World War II Memorial in Washington, D.C., April 30, 2016. 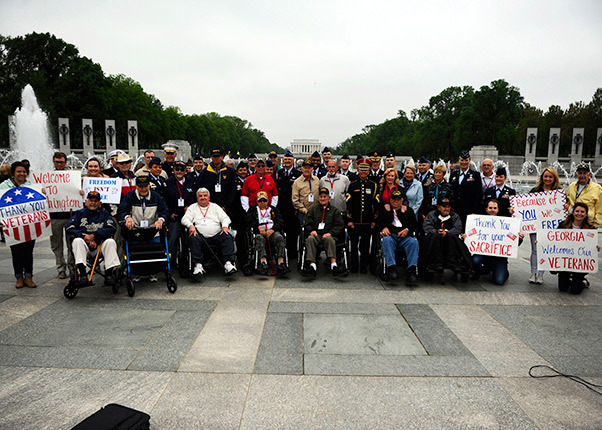 Houston Honor Flight was one of many flights to visit the nation’s capital through the Honor Flight Network. 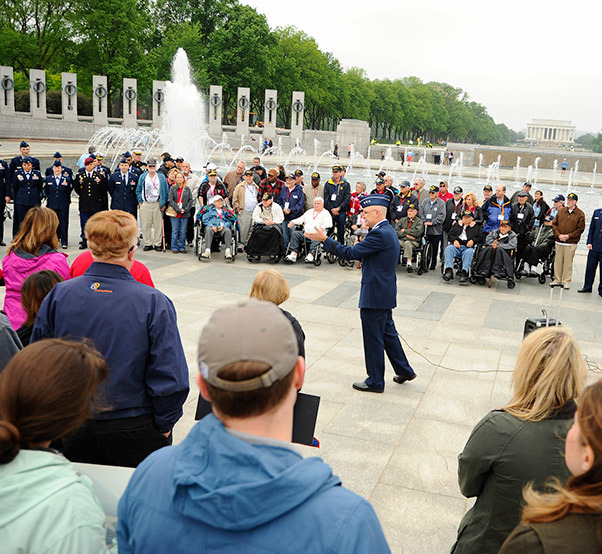 On April 30, at the heart of the World War II Memorial, Lt. Gen. Arnold W. Bunch Jr., the military deputy for the Air Force’s assistant secretary for acquisition, welcomed a group of 29 veterans from Honor Flight Georgia. Paul Bowker, a 90-year-old Army veteran from Honor Flight Syracuse, was wounded during his second night on the ground in Europe, spent a month recovering and went back to war. He walked down the ramp studying each of the bronze murals while sharing the experience with his oldest granddaughter. At 100 years old, Army veteran Paul Merriman said he had three close encounters with the Germans. 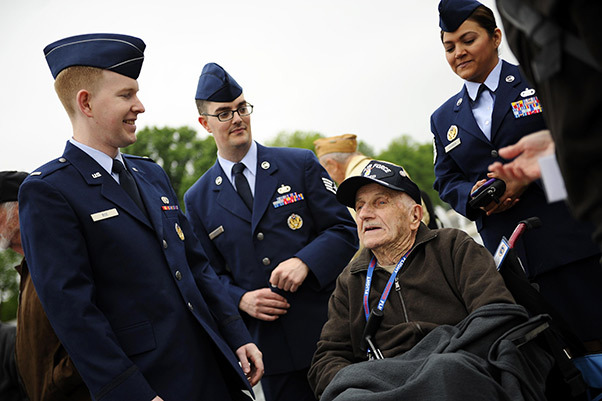 Airmen visit with a World War II veteran from the Georgia Honor Flight at the National World War II Memorial in Washington, D.C., April 30, 2016. 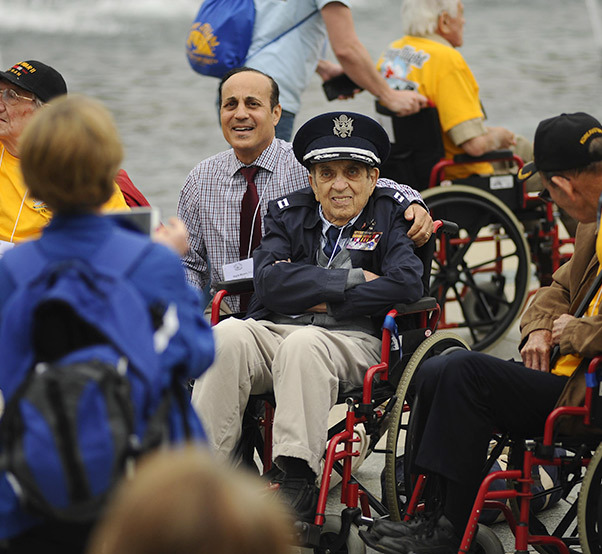 The Georgia Honor Flight was one of many such flights to visit the nation’s capital. Upon their arrival, flight members were greeted by military personnel, Honor Flight volunteers and well-wishers. The next day, he said, they found lifesaver flyers and boot prints in the ground from the Germans who were looking for him and his two friends. He still carries one of the flyers with him to remind him of how close he came to being captured. This marked the first visit to the memorial for nearly all of the veterans who made the trip with the Honor Flight Network, making the event even more special. Donald Jones, a 93-year-old Navy veteran, was one of those first-time visitors to the memorial. 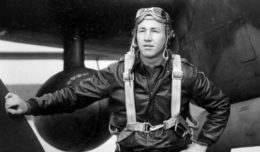 In 1944, Jones landed on Omaha Beach in German-occupied France at 6 a.m. on the first day of the invasion and left that evening. He recalled the 5,000 men he and his brothers-in-arms lost on the beach that day. 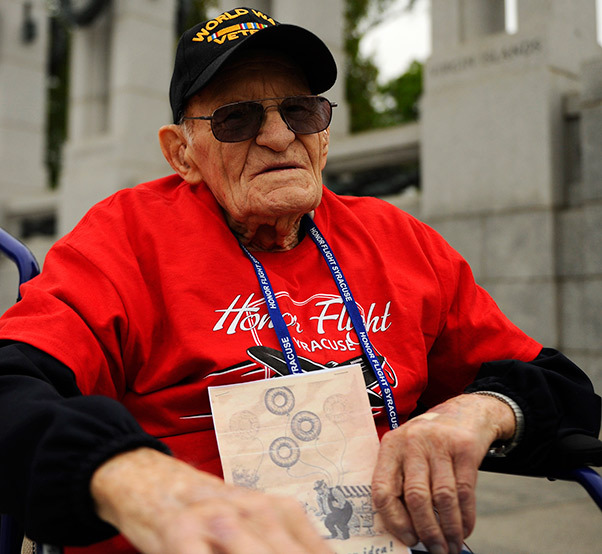 Paul Merriman, a World War II Army veteran, visits the National World War II Memorial in Washington, D.C., April 30, 2016, as part of Syracuse Honor Flight. Merriman holds a copy of the leaflets the Germans left him and his brothers-in-arms while they were a sleep. Some of the veterans participating in the honor flight also caught up with long-lost friends who shared the experience of the war. Harold Bradley and Harry Miller both served in the same unit at the Battle of the Bulge. Bradley, who lives in Houston, tried three times to make the trip to visit the memorial he had heard so much about from Miller. 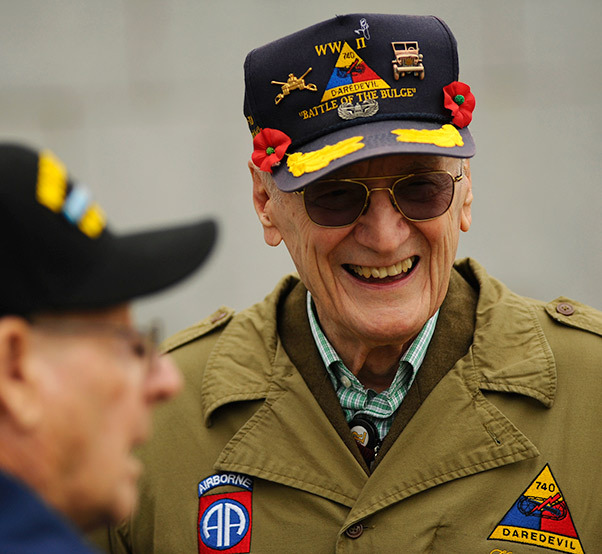 Harold Bradley and Harry Miller, both World War II Army veterans, reunite during an honor flight trip at the National World War II Memorial in Washington D.C., April 30, 2016. Bradley and Miller served in the same unit for the Army at the Battle of the Bulge and were able to reunite when Bradley was selected to participate with Honor Flight Houston. Miller, who lives in the area, has visited the memorial often and wanted to share the experience with his friend. They walked around the memorial sharing stories with people who came up to them to thank them for their service. 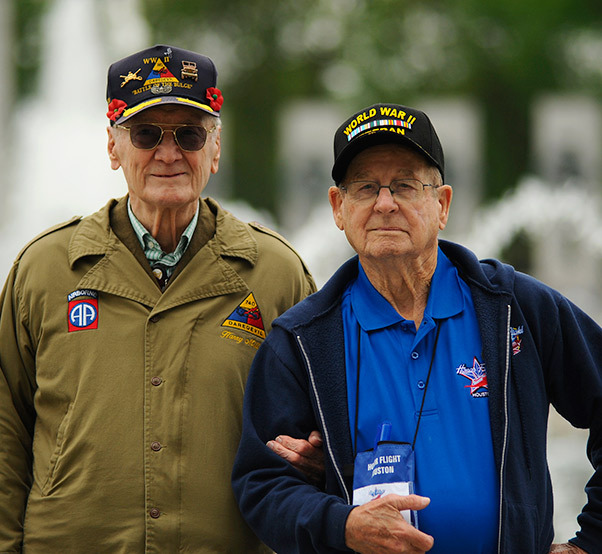 Harry Miller and Harold Bradley, both World War II veterans, reminisce at the National World War II Memorial in Washington D.C., April 30, 2016. Bradley and Miller served in the same unit for the Army at the Battle of the Bulge. The Honor Flight Network is a nonprofit organization that provides America’s veterans a free trip to the nation’s capital to visit memorials. Service members and civilians thank World War II veterans for their service at the National World War II Memorial in Washington, D.C., during an Honor Flight ceremony April 30, 2016. The Honor Flight Network is a nonprofit organization dedicated to transporting America’s veterans to the nation’s capital to visit the memorials.